You may not realize it, but there is more to rocks than meets the eye. Every rock is a record of the environment in which it was formed. Cold windy days are good days to play on the computer researching. Geology is the study of the earth's history. The materials that make up this earth and how these materials change over time. Mineralogy is a study of the different minerals that compose rocks. 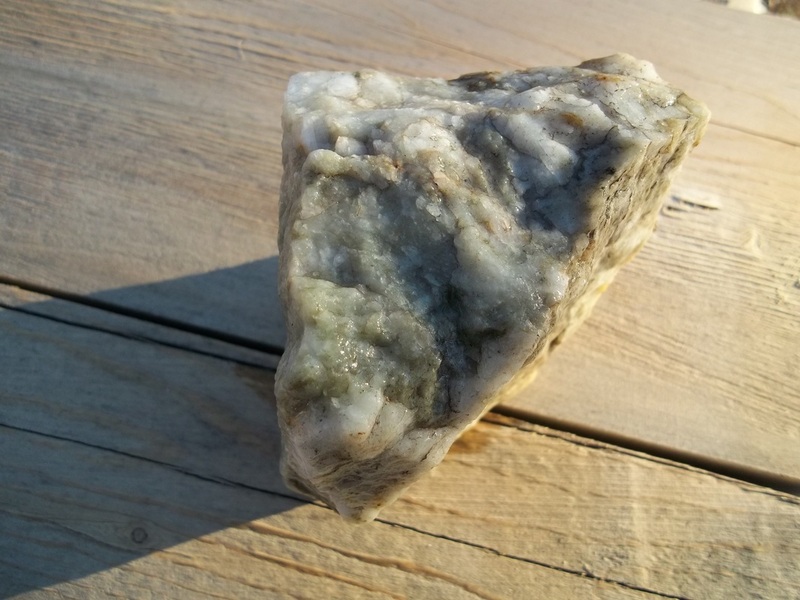 A rock is a naturally occurring solid aggregate of one or more minerals or mineraloids - a mineral like substance that does not demonstrate crystallinity. Igneous: Formed by the cooling of molten material Classified by whether they cool on the surface (volcanic) or while still under ground (plutonic) and by composition. Metamorphic: Rocks that are formed from other rock that has been exposed to heat and pressure over time. Classified by the direction and intensity of pressure or degree of heat, and the resulting changes from the original rock to the new type. Sedimentary: Are composed of the accumulations of sediments in water or from the air. Sediments are made up of rock particles, can include animal remains, plant remains or a mixture of all three. All rocks are made up from one or more of the known 4,900 minerals. A mineral is a naturally occurring substance that is solid and stable at room temperature, representable by a chemical formula and formed as a result of geological processes. 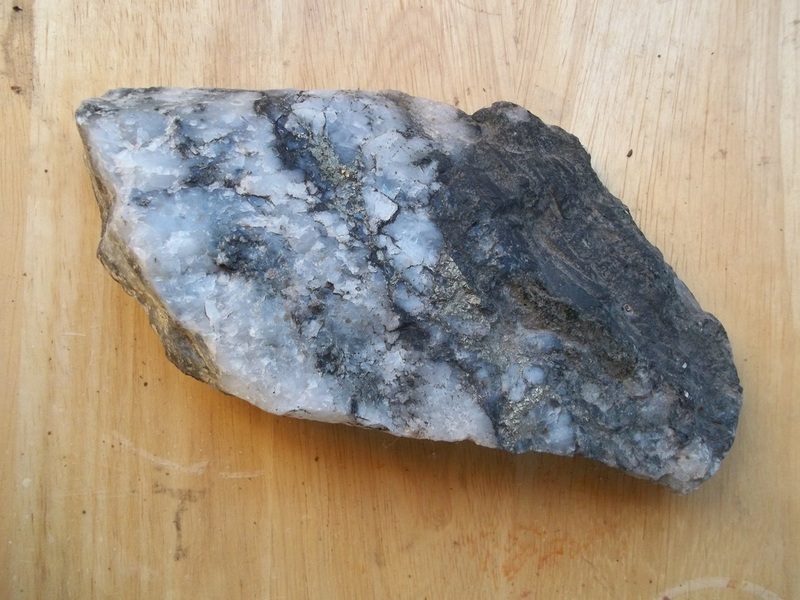 Vein - is a distinct body of minerals within a rock. Veins form when mineral constituents carried by a water solution within the rock mass are deposited through precipitation. The flow of this mineral bearing water is usually due to circulation of very hot water contained within the rock creating high pressure. Often this process occurs deep underground in granite. Outcrop - Is a surface area where a vein is exposed. Dike - is a sheet of rock that formed in a crack in a pre-existing rock body. Sill - is a dike that is formed between layers of a layered rock. Where a vein outcrops it is subject to weatherization. The breaking down of the rock from the weather, freezing, heating, wind, and water erosion. A lot of minerals, like GOLD, will move down hill from this weatherization of it's primary vein. 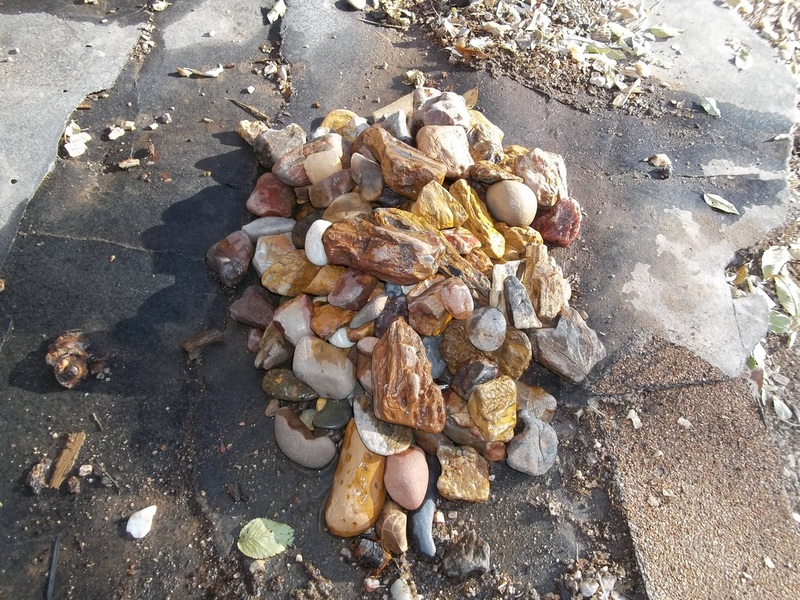 When I'm out prospecting I normally walk up a drainage first, paying close attention to the individual rocks that make up the gravels in the bottom of the drainage. This gives me an indication of what is up hill from me. Say I find a lot of small garnets in the gravel in the drainage, I know that up the drainage there is a outcrop that has more garnets. So I follow the drainage uphill sampling the gravels until I don't find any garnets. I then know that the garnets came from one side or the other of the drainage. I climb on slope of the drainage, if I don't find garnets then I try the other slope. Eventually you can follow the trail of the mineral to an outcropping. Garnet is just an example, this process works for the majority of minerals. This process does not work very good on relative flat ground. As I explore a drainage I pay attention to the different rocks. Often I'll return and collect a volume of nice looking rock that I found. 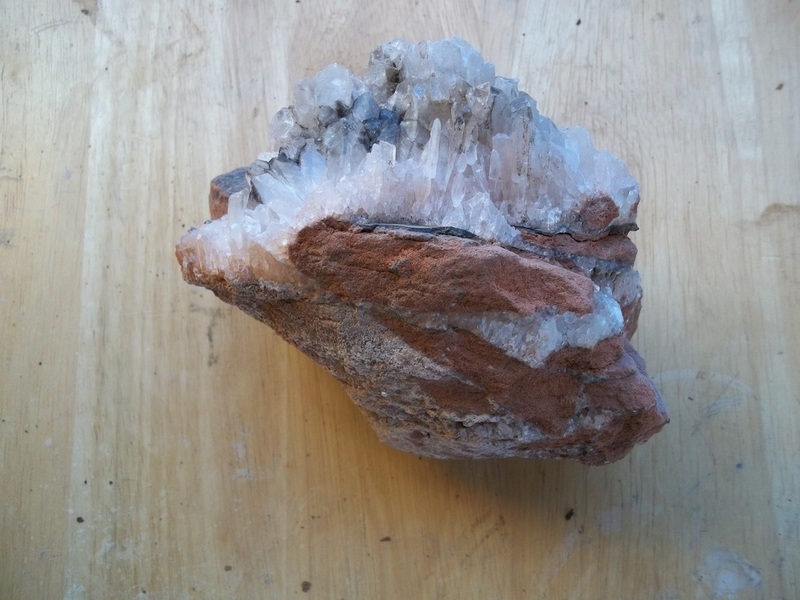 I once found an outcrop of very good Varicite in Skin Gulch, when the Forrest Service re-opens the area I'm going to go and collect some more of this mineral. The Forrest Service closed the area after the High Park fire due to public hazards (?). In September the area was subject to a flash flood which should have exposed a lot of previously unknown materials. As molten granite crystallizes, the melt that remains becomes enriched in water and rare elements such as boron, lithium, tantalum, and niobium. These elements concentrate in the melt because they are not taken up by the minerals crystallizing from it. Eventually, enough water builds up that steam forms. Gem and ore minerals containing rare elements form in the pockets of steam- and water-rich melt. In the presence of water, minerals can grow to enormous sizes, forming rocks known as pegmatites.